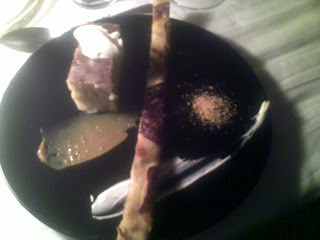 Sometimes I'm lucky enough to stumble upon the occasional hidden away eatery that is truly unique, a little bit under-the-radar, and with an edge of naughtiness. Somewhere with a rebellious spirit and a generous nature. I almost don't want to tell you about this one, but I'm feeling festively generous. 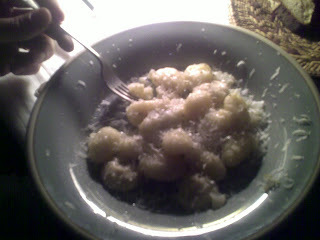 And the food is a-mazing. Here it is: The Saltoun Supper Club, one of London's most feted underground restaurants presided over by a gregarious and enigmatic moustachiod cook. You won't be eating in a regular joint where you can book a table to order: there's a phenomenal waiting list, the restaurant only opens on Wednesday and Thursday nights and you'll be eating in Arno Masdoorp's second floor flat in Brixton, South London. Not only will you eat a meal fit for the gods, but you can rummage through his flatmate's book collection and smoke an illicit ciggy out of the skylight! Arno has been running his supper club from March of 2009. From the moment you ring the doorbell of the unassuming Victorian terrace on Saltoun Road, you feel the thrill of the unknown. You don't know who you'll be sat next to or what the atmosphere will be like. But there's nothing to fear except having fun! He comes to greet every diner personally (there's only room for 14 people), and you sit in his living room which is festooned with curious and ornaments, and every table is beautifully decorated with striking design touches and vintage curios. It's like sitting in a jewel box - there is so much to look at. Arno and his head waiter (usually one of his good friends) are quick to make everyone feel at home and you're told you can roam everywhere you please in the house. 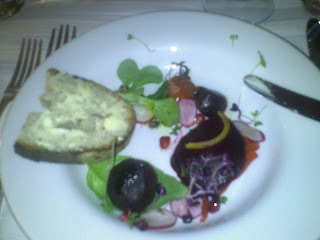 Such a humble looking salad which was an 'umami'-laden mix of savouriness, earthiness and zingy citrussy oil - amazing. And the bread was craggy sourdough from the Wild Caper deli in Brixton Market. Four of us greedily got through THREE baskets of this bread...oops...that's nearly one basket each! Really buttery pastry, caremelised pears and heavenly salted caramel...I am crazy for the salt-sweet combination of caramel, salt and pears! Wow-ee - how cute is this? 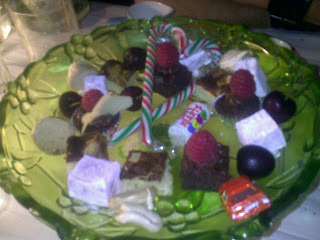 A delightful selection of mini chocolate brownies, nougat, Turkish delight, vintage-style candy canes and chocolate toy cars? Heart be still!!! Between courses, you're encouraged to go upstairs to Arno's flatmate's bedroom and have a cigarette out of the skylight, and you can sit on sofas and rummage through the books that are stacked floor-to-ceiling in artful piles. After dessert, he and his waiter serve up coffee or tea in vintage mis-matched cups and kitsch coffeepots, and then for the diners that linger, he generously cracks open his own wine supply and pops glamorous decanters down on the table. Arno sits and has a chat once the meal has ended, and he keeps on pouring the vino. It's very hard to leave! You get all this for a very modest suggested 'donation' of £25 per head, which is staggeringly cheap for the superb level of food and number of courses (and it's BYO). Arno told us that he doesn't really make much money from doing the Supper Club two nights a week, but that it acts as the perfect vehicle to spread the word about his catering service. This is clearly a man who is passionate about food and entertaining - it takes guts and a lot of energy to invite strangers into your home and feed them to such a high standard week after week. But you sense that he and his flatmate absolutely thrive on the buzz and theatre of it. Oh wow, Thank you so much for sharing, don't worry about the photos we get the jist and the petit fours are really innovative idea. 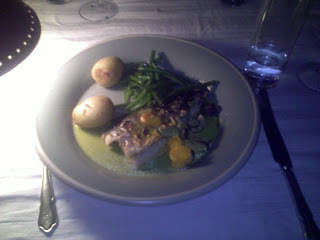 I am envious that you got to enjoy this, but through you I am glad Ihave discovered the Saltoun Supper club. I also really like your blog, so will sure be back.